When I was a child, I was absolutely convinced that Peter Pan was real. I still believe it in the nethermost parts of my heart. I imagined Peter would fly in through my window, and we would go off and have adventures.... different adventures than he had with Wendy, but wonderful adventures none the less. I now know that it can never happen. This morning The Boss brought me the case to Peter Pan and insisted we watch it. 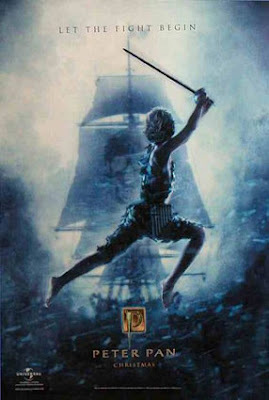 Not the Disney Peter Pan, but the "live action" Peter Pan. It was wonderful to see the magic enter him, and his eyes light up. Every times someone flew, he would tell me so. excitedly. When the boat flew, I had to hold onto him, because he almost floated to the ceiling in ecstacy. Now, I worry that one day I will go into his room and find the window open, and his bed empty. He will be off to have all the adventures I never got. I told him he can't ever leave me like that. He has to tell me he is going, and then I will let him go, because Peter never allows anything bad to happen to his friends. The Boss laughed at me when I told him that. Part of me wants to bar his windows to keep Peter out, but the other part wants to open them wide, and let all the adventure and excitement in. And you can let him in again with THIS! Hmm well I'm planning on making a pirate baby room, so I guess that would mean I was letting him in. I haven't seen that movie in quite a while! My sister Michelle used to have a huge crush on him!